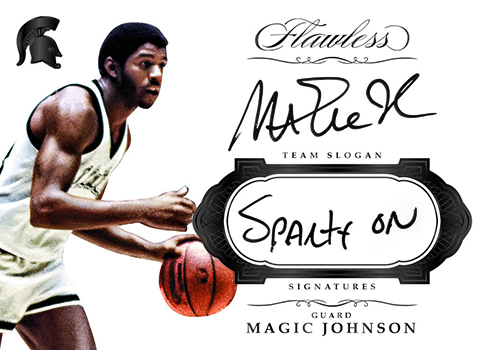 As with everything Flawless, virtually all of the product is dedicated to premium autographs and memorabilia. Those cards that don’t? They have gems embedded in them. Regular base cards in 2017 Panini Flawless Collegiate Basketball feature past college stars in their school uniforms. Numbered to just 20 copies each, they have a diamond. Parallels fold in other gems like Ruby (/15), Sapphire (/10), Emerald (/5) and over-sized Diamonds (1/1). Rookie Patch Autographs highlight members of the 2017 rookie class. 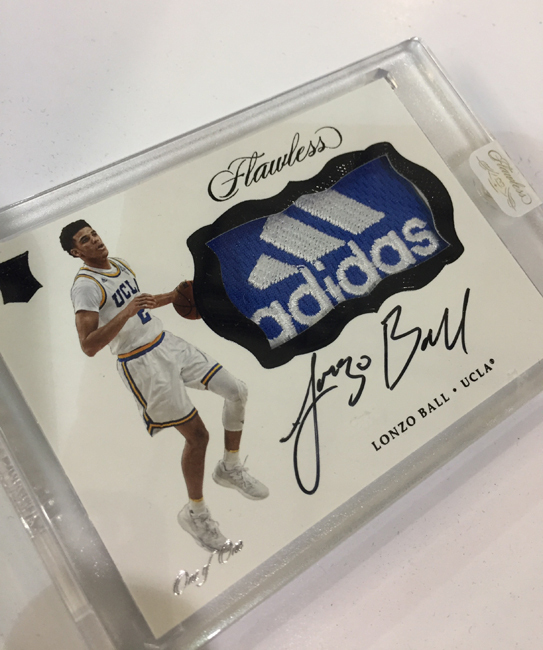 That means signatures and premium swatches from the likes of Lonzo Ball, Jayson Tatum, Markelle Fultz and more. Parallels include a variety of logos including the NCAA, teams and other brand marks. 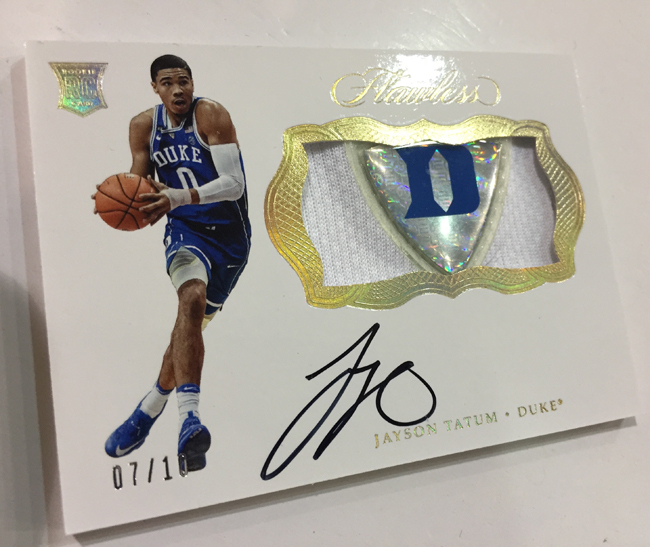 Unless it’s a cut signature, autographs in 2017 Panini Flawless Collegiate Basketball are on-card and have no more than 25 copies each. 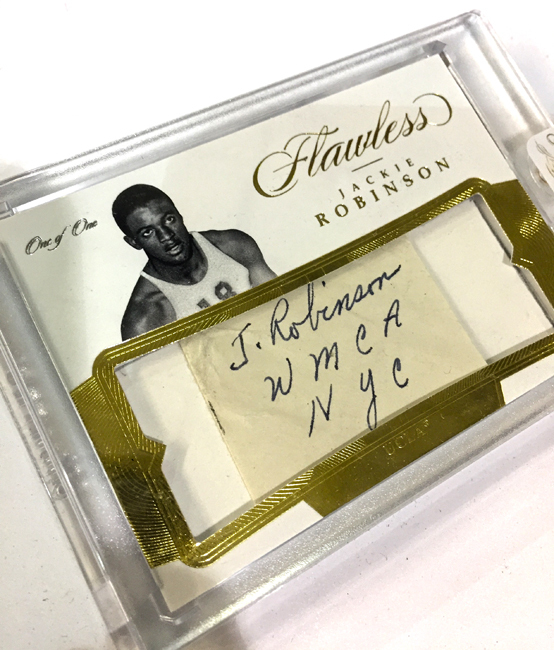 Patch Autographs take on a similar design as their rookie counterparts. However, the checklist highlights veterans instead. 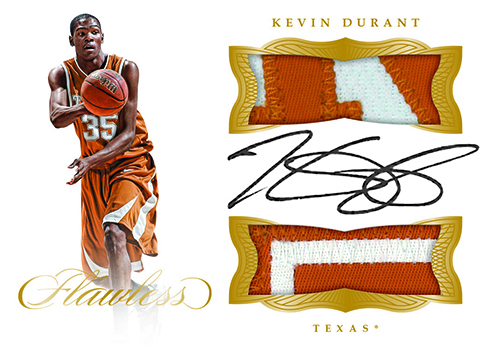 Dual Patch Autographs switch the design up a little bit to make room for a second over-sized premium swatch. 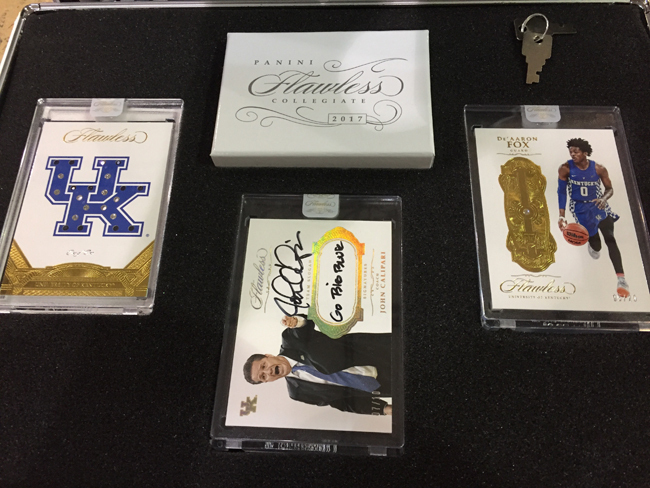 2017 Panini Flawless Collegiate Basketball has several other autographed inserts. 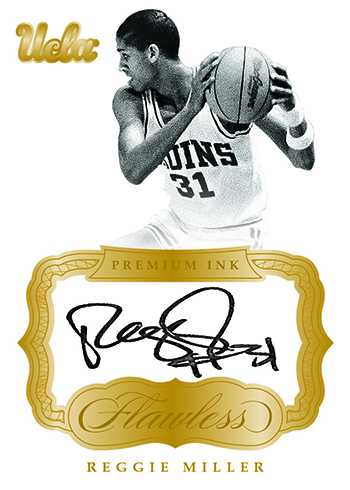 Premium Ink takes a somewhat straightforward approach, albeit, according to Panini, with a checklist of only top talent. Team Slogan Signatures offer a bit of a different take on inscriptions. These have a note synonymous with the player’s school attached to it. 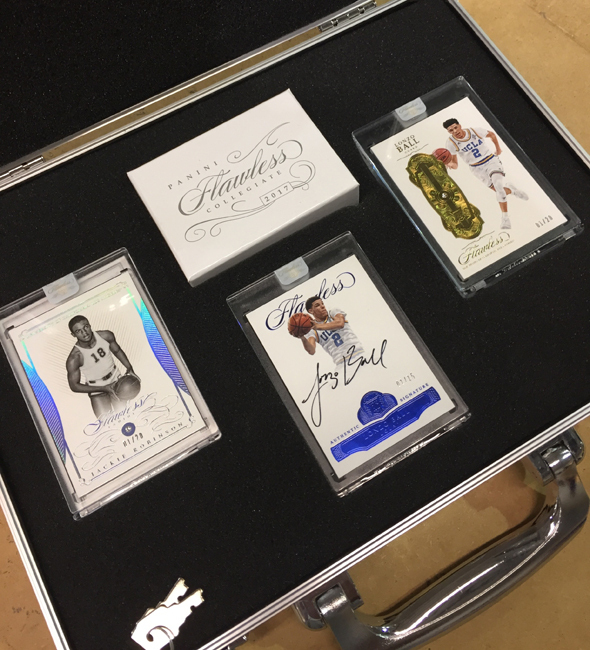 Other themes include Flawless Dual Signatures, Rookie Autographs, Team Logo Signatures and Dual Diamond Memorabilia Autographs. One insert set doesn’t have signatures or swatches. In fact, it doesn’t even have players. One-of-one Flawless Team Gems take a school’s logo and bling it out with a variety of gems. 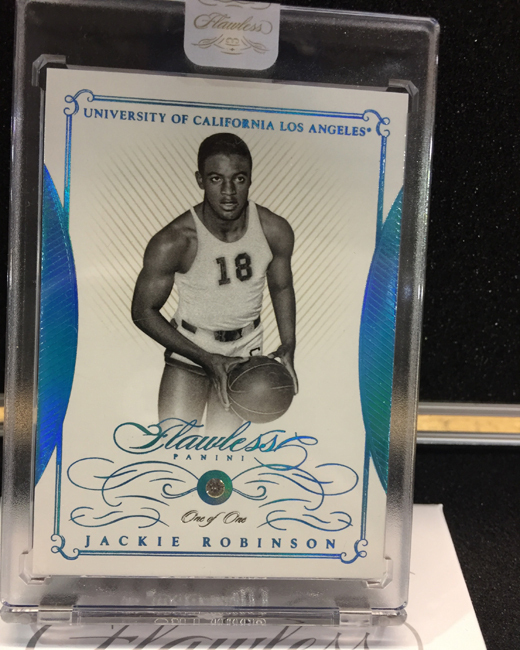 Some 2017 Panini Flawless Collegiate Basketball boxes feature only cards from either the University of Kentucky or UCLA.